Located in the coastal mountains above Santa Cruz, Mount Cross is a beautiful site perfect for group building and environmental education programs. This area provides endless opportunities for outdoor science, hiking, and challenge activities. 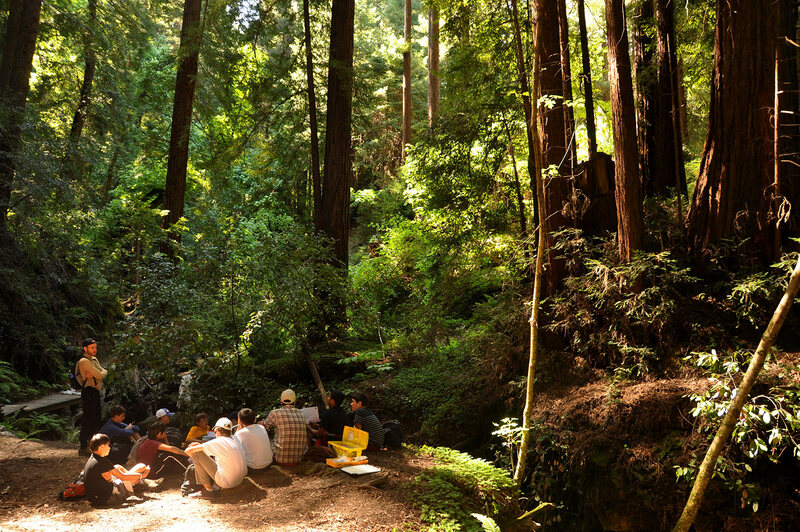 Located in the mountains just outside the city of Santa Cruz, Naturalists at Large uses Mount Cross Camp near picturesque Felton for Santa Cruz mountain programs. The camp features a swimming pool, a challenge course, playing fields, modern well-kept accommodations, and child friendly meals. A variety of programs can be put together at this superior site. Students can do the ropes course and climbing wall in addition to environmental education. Naturalists at Large’s experience has been that the students’ participation in the process of learning and living together provides the basic framework for a successful outdoor program. The program will emphasize outdoor skills, along with an introduction to the various environ­ments of the Santa Cruz Mountains. Naturalists at Large takes respon­sibility for evening ac­tivities. Naturalists at Large instructors work with their groups to teach basic outdoor skills, conduct outdoor education activities on local trails. Students are constantly encouraged to solve problems posed by the Naturalists at Large instructors, comprised of both intel­lectual problems and well thought-out and well executed physical problems (i.e. initiative activities). Each trail group is with a Naturalists at Large naturalist-instructor, and a faculty or parent chaperon each day for the entire program.